Energy is a game mechanic that primarily functions as Stamina for every Staff member in your prison. This article is about the stamina of your staff. For information on electrical energy, see Utilities. For information on the prisoner sleep requirement, see Needs. An exhausted Guard quickly regaining his energy in a Staff Room. All members of your Staff could become exhausted over time as they worked. The Staff Room allows your staff to rest and regain energy much quicker than elsewhere. Information on the energy of staff members can be found within the save game of any .prison file. Within the file, energy is saved in points ranging from 0 to 100. With the exception of the Dog Handler and Guard Dog, any controllable staff member who is resting can still be ordered to go somewhere by the player. However, doing so interrupts the staff member from recovering energy and will cause them to lose energy again. Once energy goes below 20 points, a green energy bar will be shown underneath the staff member and will have "Tired" written on it. If energy goes below 5 points, the movement speed of the staff member will be significantly slower. For guard dogs, energy is lost at a rate of 0.05 points per in-game minute, or 3 points per in-game hour while the dog is idling in the Kennel. However, when the dog is sent out to patrol, it will start losing energy at a rate of 0.3 points per in-game minute, or 18 points per in-game hour. It is assumed dogs lose energy very rapidly because of their abilities to sniff out Smelly Contraband, check for tunnels, and chase escaping prisoners quickly. Guard dogs become fully exhausted once they reach 0 energy points. When a guard dog becomes exhausted, it will no longer continue to patrol and its dog handler will take it to the kennel. While resting, guard dogs recover 0.6 energy points per in-game minute, or 36 points per in-game hour. It will take a fully exhausted guard dog 2 hours and 45 minutes in-game to regain 100 energy points, wake up and resume patrols. However, if a Dog Crate is not available in the kennel, or if the kennel was never setup, the guard dog will not rest and no energy will be recovered until its needs are satisfied. Guard dogs will have around 6 in-game hours of energy to use on patrols. For staff members, energy is lost at a rate of 0.05 points per in-game minute, or 3 points per in-game hour while they are working. Staff members become fully exhausted once they reach 5 energy points or less. If a Staff Room is unavailable, the exhausted staff members stop what they are doing and begin to rest. Energy is recovered at a rate of 0.3 points per in-game minute, or 18 points per in-game hour. The major downside to this is that staff members will only recover 50 energy points which takes 2 hours and 45 minutes in-game and leaves them partially energized. When a staff room is available, exhausted staff members will go to the nearest one, but during this time they will not recover energy. Once the staff member enters the staff room, energy will begin to recover at a rate of 2 points per in-game minute, or 120 points per in-game hour. The staff room will fully energize all staff members to 100 energy points in just 50 in-game minutes. 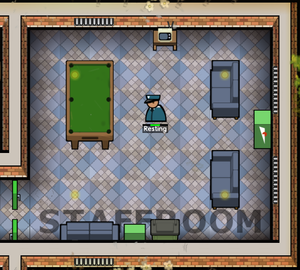 Staff members will have around 16 in-game hours of energy if they rested without a staff room, and about 32 in-game hours of energy if they rested in a staff room. Staff members will not lose energy if there are no prisoners in your prison. Dog handlers are currently the only staff members that do not suffer from exhaustion. Hiring any staff member spawns them with a random amount of energy, but never below 20 points. Workmen who idle in the Storage room don't lose energy. Injured staff members lose and recover energy just the same as if they were healthy. Armed Guards are the only staff members that will rest in the Armoury instead of the staff room. This page was last edited on 28 June 2018, at 10:38.